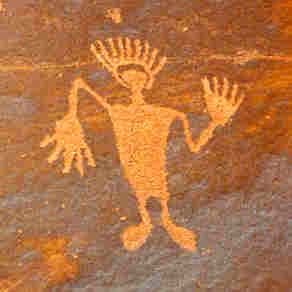 One frequently seen use of the hand in rock art is in depicting a human figure with extremely large hands, and often extremely large feet. This is not an early attempt at cartooning, even if this seems humorous to our modern eyes. According to Native American informants, this denotes power, and can have many meanings, dependent upon use. This power symbol could be warning to raiders to turn away, as �We are strong and powerful here�, or depending upon the other symbols in the panel, and its location and use, is often a symbol for the Creator. 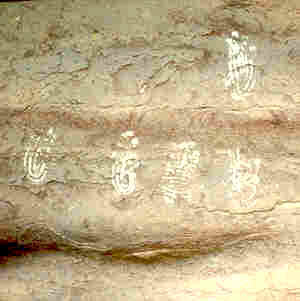 Another use of the hand that is common in rock art is the simple symbol of the hand alone, often found in large groupings. 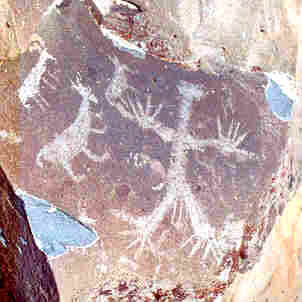 These hands are usually pictographs, and are painted , sprayed in outline, or �stamped�, by painting designs upon the palm and fingers and then applying the hand to the rock surface. What do these mean? We are fascinated by them, particularly the panels that are done in many different colors. There is something about these simple images that appeals to our common humanity, like a �Hello!� that echoes down through time. But what do they mean? These hands could be as simple as saying � I was here�, or , as some believe, a recording of those who have gone through an initiation ceremony. 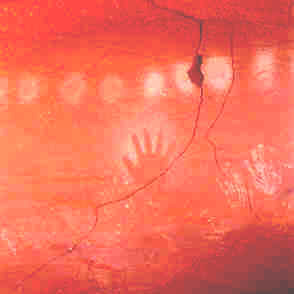 So, armed with the possibility of a connection between rock art and sign language, go out there and LOOK! Don�t be afraid to think, and to ask questions (tactfully) of Native Americans. We need to share our knowledge.